Sometimes it seems as if everybody is trying to rip off his own little piece of America, until we are all torn apart. A reader writes: "Liberals hold us individually responsible for nothing but collectively responsible for everything." The last time I saw a Republican express outrage was 1991, when Clarence Thomas told the Senators what he thought of the smear tactics used against him. Before that, it was Ronald Reagan saying, "Mr. Gorbachev, tear down this wall!" Before that, it was probably Teddy Roosevelt. Too many people in positions of responsibility act as if these are just positions of opportunity -- for themselves. The ones who simply steal money probably do less harm than teachers who propagandize their students, media who slant the news or politicians who sell out their country's interests in order to get re-elected. A reader wrote: "Have you ever noticed that opinion polls ask the opinions of people who have no expertise in the subject on which they are being polled and publish these opinions as if they were gospel truth instead of group ignorance?" 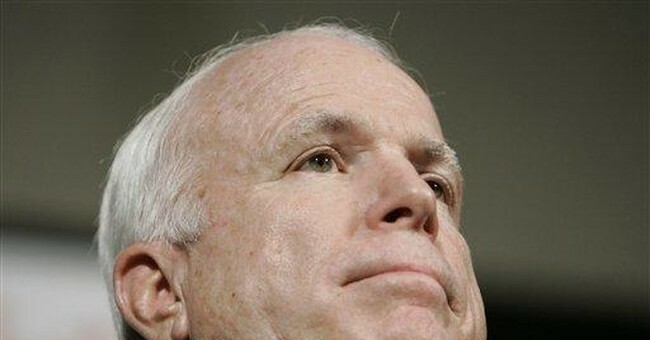 Judging by the polls, Republican voters' memories do not seem to be as short as Senator John McCain may have thought. Judging by press coverage, the media's memory does not seem to have been as long as he may have thought when he played to that gallery. A sign of the times: A full-page ad for an Alaska cruise in the left-wing New York Review of Books says, "See Alaska's Glaciers Before They're Gone!" Shipmates listed include Ralph Nader and the editor of The Nation magazine. The people who are scariest to me are the people who don't even know enough to realize how little they know. A reader sent the following message, quoting his nephew: "Calling an illegal alien an 'undocumented worker' is like calling a drug dealer an 'unlicensed pharmacist.'" Some of the biggest cases of mistaken identity are among intellectuals who have trouble remembering that they are not God. Our education system, our media, and our intelligentsia have all been unrelentingly undermining the values, the traditions, and the unity of this country for generations and, at the same time, portraying as "understandable" all kinds of deviance, from prostitution to drugs to riots. The home run records that made Babe Ruth famous have been broken but one of his records will probably never be broken -- pitching the longest shutout in World Series history, 14 innings. Few pitchers go even 9 innings these days. "Global warming" seems to be joining "diversity," "gun control," "open space" and a growing list of other subjects where rational discussion has become impossible -- and where you are considered a bad person even for wanting to discuss it rationally. Is your employer poorer by the amount of money he pays you? Probably not, or you would never have been hired. Why then should we assume that a corporation or its customers are poorer by the amount paid to its chief executive officer? A review of one of the many environmentalist books says that even if you can't do all you would like toward "living green," you can at least "congratulate yourself on taking small steps to improve the planet." That is what environmentalism -- and much else on the political left's agenda -- is really all about, self congratulation. Just watching Suze Orman for a few moments while channel surfing is enough to make me feel exhausted. When I see the worsening degeneracy in our politicians, our media, our educators, and our intelligentsia, I can't help wondering if the day may yet come when the only thing that can save this country is a military coup. In his book "Income and Wealth," economist Alan Reynolds says that people often form "strong opinions" based on "weak statistics." Unfortunately, that is also true of a wide range of other issues, from "global warming" to "gender bias." I am so old that I can remember a Democrat, at his inauguration as President, say of our enemies: "We dare not tempt them with weakness."